Who else has Toy Story Land or Pixar fest on the brain? With Toy Story Land opening June 30th at Hollywood Studios and Pixar Fest happening all summer at Disneyland, we are all over EVERYTHING Toy Story and of course Pixar. 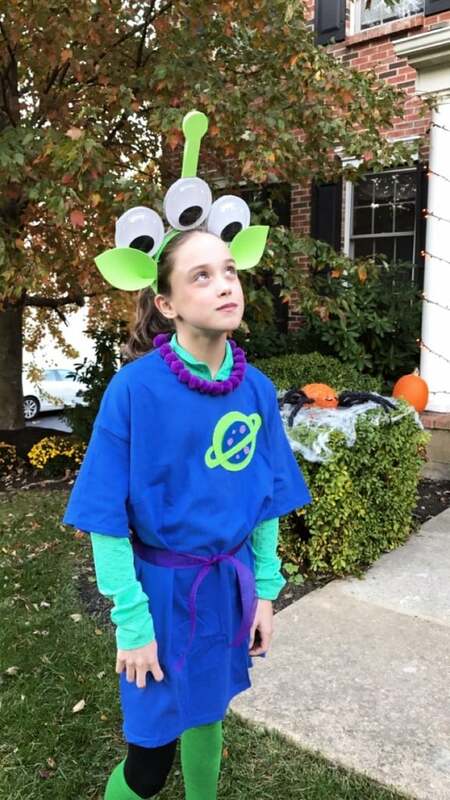 The little green aliens are a favorite in our family so Kenzie was inspired to make a Toy Story Alien Costume! 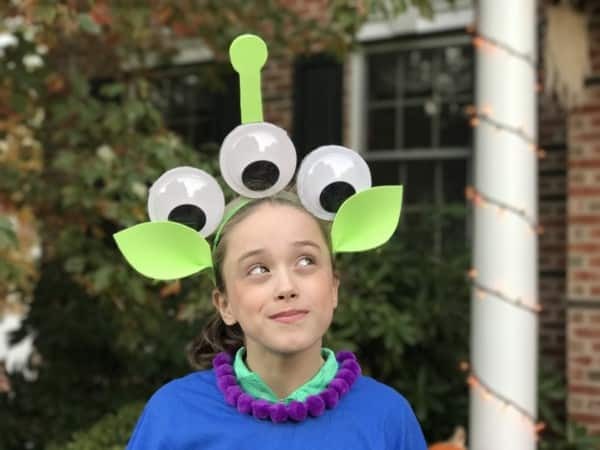 Check out our photos and videos for some inspiration on How to Make a DIY Toy Story Alien Costume. Super easy! You can check out all the details on Toy Story Land including photos and details on the new rides here too! This actually turned out a lot easier than I thought it would! And if your a real Toy Story fan like us you’ll recognize Kenzie is totally an Alien from Pizza Planet’s claw machine. We bought all our supplies at Michael’s for one stop shopping. Simply, scissors for cutting and then a Glue Gun to put it all together! You can tell we used a giant Blue Tee shirt to create a “dress” of sorts with a purple ribbon stash. It worked! We wanted green leggings but had to settle for super tall green socks as green leggings were ultimately impossible for us to find! Don’t forget that Pizza Planet Logo on your apparel! We just used felt and glue to create our mini logo – it’s not perfect but it works! 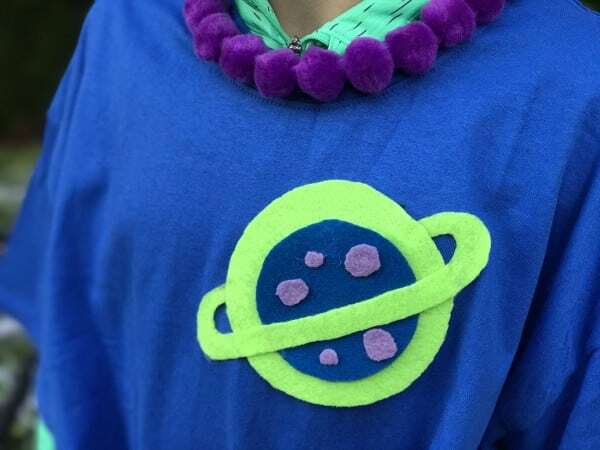 And for the collar we just glued on a lots of purple pom poms! This is an amazing addictive video game,people are going to crazy for this to play online and free.There are many more gaming Junction but one of the most popular where players likes to play more is this. hi, do you know what size of googly eyes you used? 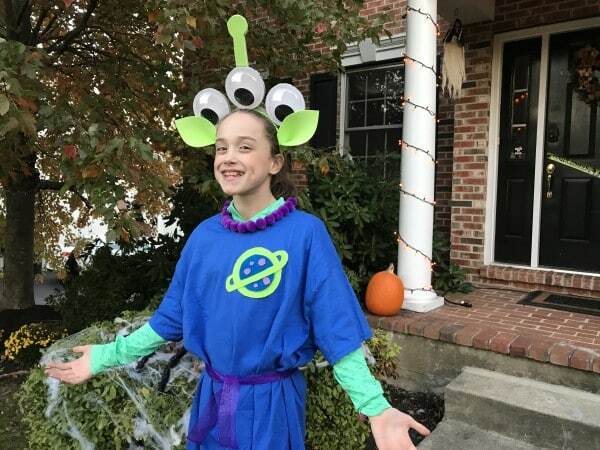 love your costume!